Trekking - 3 days - Trekking in Luang Namtha, Laos - Hiking, Kayaking, Cycling, Village Tours - Discovering Laos! Great for passionate trekkers with good fitness levels, who also want to learn the secrets of jungle survival! Feast your eyes upon jaw-dropping views across the hills and valleys of Namha NPA – cameras at the ready! At 9.00am we meet at the Discovering Laos office and take a tuk-tuk ride to the start of the trail near Houy Leuat village. On route we stop off briefly at the local Laos market for supplies. From the start of the hike we find ourselves immediately immersed in lush tropical forest, as the trail leads us deeper into the jungle. 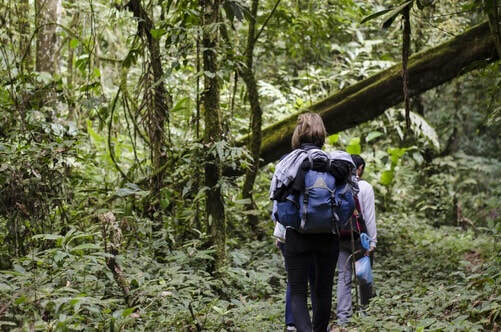 We continue hiking for 2-3 hours over hills and valleys shaded from the sun by the magnificent jungle canopy. At lunchtime we stop at a perfect spot in jungle for a well-earned Lao picnic, expertly prepared by our guides using the resources of the surrounding environment. We continue on the trail through a hugely impressive primary forest populated with a rich diversity of flora, including mighty mahogany trees, bamboo groves and wild banana plants. After finding a suitable jungle campsite our guides will teach you how to construct a banana leaf shelter for the night, and how to select and find the right building materials. Relax, have dinner and drinks by the campfire, sing and share stories and later fall asleep to the enchanting sounds of the raw jungle. Wake up in the heart of the jungle to gentle birdsong and a tasty breakfast laid on by our ever-attentive guides. We start walking on the trail at around 10.00am with a rewarding hike over richly forested hills and across lush and verdant valleys. Lunch time – jungle style! 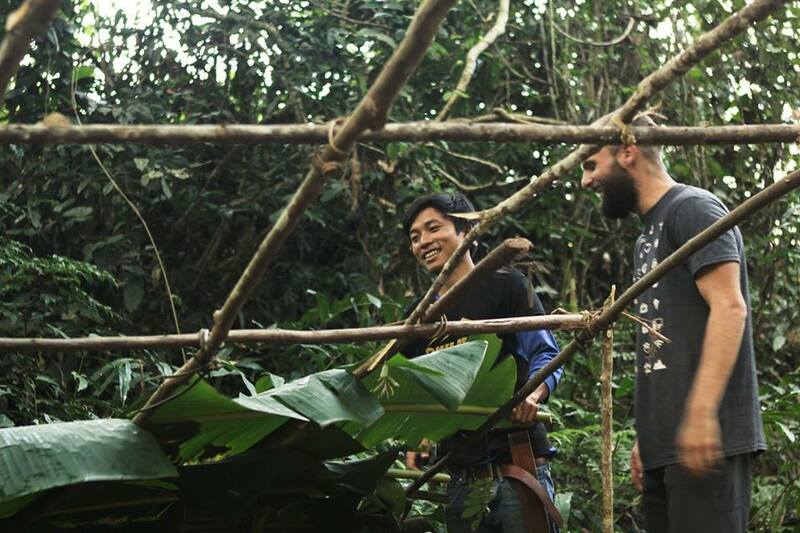 Learn from our guides how to find and prepare your own food using the resources of jungle. Watch, learn, and get involved cooking your lunch using authentic jungle techniques. Back on the trail we continue our hike through ancient forests filled with life. Before long we begin a steady descent on a hillside with jaw-dropping views across the valleys of the Namha NPA. Around 3:00pm, we reach the picturesque and timeless Nam Koy village of the Khmu tribe. Meet the locals and learn about their unique way of life, before we continue on the trail, running alongside the serene Namha river, and soon reach Nalan Tai village, another Khmu settlement and our home for the night. *On DAY 3 below there are two options for a moderate or challenging trek to end your tour, you decide and tell us! ​Wake up to the enchanting sounds of the jungle and a delicious authentic breakfast. 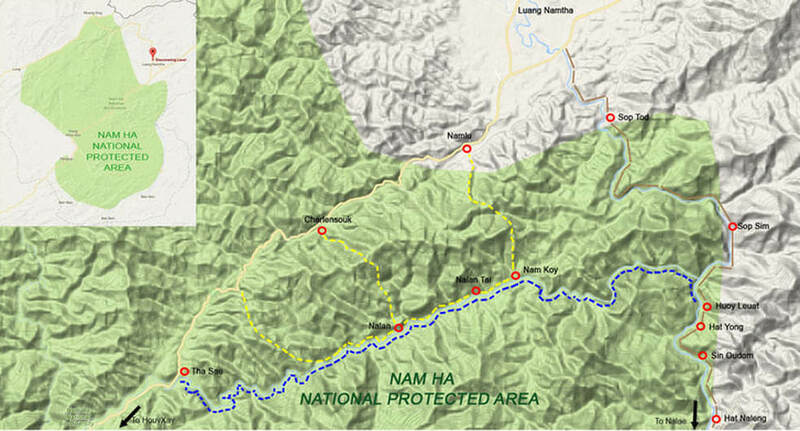 At approximately 10:00am we begin a 2-3 hour hike along the serene and scenic Namha river, passing huge trees, enveloping fields of bamboo and quaint tribal villages. We reach Nalan village around midday and, after exploring the village and meeting the locals, we stop for a tasty Lao lunch. Back on the trail we steadily descend through luscious rainforest until reaching the Chalermsouk village of the Khmu people. After passing through exquisitely cultivated lands the trek ends at traditional rice storage houses amidst a patchwork of paddy fields. From there we take an invigorating tuk-tuk ride back to the Discovering Laos office, arriving back in Luang Namtha at approx 4-5:00pm. *If you like a challenge, you can pick Option 2 for Day 3. Wake up to the enchanting sounds of the jungle and village life with a delicious and authentic Lao breakfast. At around 9:00am we begin a 2 hour hike along the serene and scenic Namha river, passing huge trees, enveloping fields of bamboo and quaint tribal villages. We reach Nalan village and, after briefly exploring the village and meeting the locals, we stop for a tasty Lao lunch. We continue hiking the trail running alongside the beautiful Namha river, with picturesque views all the way. Eventually, we return to the jungle trail and start hiking through a pristine primary forest, home to a rich abundance of animal and plant life. The trail leads over steep and rugged hillside before making a steady descent through dense tropical forest. By 5:00pm we reach Doi Luk Kham village and the end of our trekking adventure. From there we take an invigorating tuk-tuk ride back to the Discovering Laos office. The price ranges from $80/person (USD) for 8+ Pax to $300/person (USD) for 1 Pax. Note: Warm clothes for the evening and night is advisable especially during the winter, between Oct-March.